As I discuss in this answer, the oldest Vishnu statue in the world, and probably the oldest Hindu statue in the world period, is the famous Ranganatha statue in Sri Rangam. The story of Ranganatha goes roughly as follows. Shortly after the birth of Brahma (which I discuss in this answer), Brahma started praying to Vishnu (perhaps with either this hymn or this hymn). As a result, Vishnu appeared before him and gave Brahma a divine statue of Vishnu lying down on the serpent Adiseshan. Much later, Surya the sun god began to worship it, and then Surya's grandson Ikshvaku had the statue brought to Ayodhya so that he could continue worship it. The statue was passed down through the kings of Ayodhya, until it came to the possession of Rama. Rama gave it to Ravana's brother Vibhishana, who planned to install it in Lanka. But on his journey from Ayodhya to Lanka, Vibhishana put the statue down in the island of Sri Rangam in the middle of the Kaveri river, so that he could bathe in the holy Kaveri. When he came back, he found that he could not pick up the statue with all his might - Vishnu wanted to stay in Sri Rangam. And that is where the statue remains to this day, in the illustrious Ranganatha temple. But my question isn't about the statue itself, but about one of his festivals. Last Saturday was the day of Panguni Revati, i.e. the day that that the Nakshatra Revati occurs in the month of Phalguna. 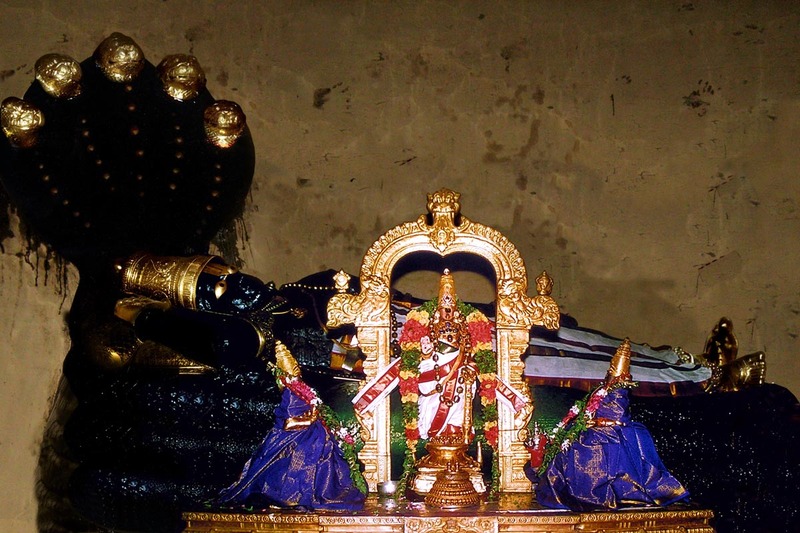 Every year on this day, the Sri Rangam temple celebrates the "birthday" of Ranganatha. My question is, what exactly does this mean? As I discuss in this answer, Vishnu is unborn and beginningless, so it can't refer to Vishnu's birth. So what event does it celebrate? The day Brahma received the Ranganatha statue from Vishnu? The day Ikshvaku brought it to Earth? The day Vibhishana brought it to Sri Rangam? This forum post claims that it was the day that Ranaganatha came to Sri Rangam, but does this have any scriptural basis? For that matter, where in Hindu scripture does the story of Ranganatha occur? On a side note, the Lakshmi statue in the temple, known as Ranganachiyar or Ranganayaki, has her "birthday" celebrated on the day of Panguni Uttaram. What does this mean, and does it have any relation to the fact that this was the day Venkateshwara and Padmavathi got married? Browse other questions tagged mythology vishnu temple idols . How were the Trimurthi born? Where do the quotes from sages in Brahma's hymn to Vishnu come from?